15 of the Best (and Most Offbeat) Attractions in Missouri! Like most states, Missouri is home to its share of unusual attractions. Hidden away among the everyday life of Missouri sits strange and unusual places with an interesting story to tell. From a hair museum, to guided tours of a fruitcake factory, you can always find something to gawk at in Missouri. Here are the 15 most unusual attractions in the state. It’s hard to imagine now, but there was a time when collecting people’s hair was considered a valid way to express your love for them. It wasn’t that long ago when the hair of a loved one could be woven into beautiful works of art and kept on display. Leila Cohoon, the owner of a cosmetology school in Independence, Missouri, collects such works of art, and displays them in a dedicated room of her school. The museum is open from 9 a.m. to 12 p.m., Monday through Saturday, and claims to display the famous hair of Marilyn Monroe, Michael Jackson, Queen Victoria, and both St. Anne and Mary of Nazareth. There is, apparently, a category of people who call themselves “vacuum lovers,” and it is chiefly for them that this museum was constructed. But even for the rest of us, it holds some interest. It takes visitors through the history of the vacuum from the early part of the 20th century to today’s industrial and luxury vacuums. The museum features novelty and celebrity vacuums from different eras of American history. Visitors can even take a tour of the plant where Simplicity and Riccar vacuums are made. The museum and factory are open from 9 a.m. to 4:30 p.m.
You might expect to find castle ruins in Scotland, Germany, or France, but you only have to go as far as the backwoods of Missouri. The castle was first built as a retirement home for Kansas City businessman Robert Snyder, who planned to spend his retirement fishing and enjoying his natural surroundings in the cliffs near Lake of the Ozarks. Unfortunately, he died before he could enjoy it, and although his sons finished the construction, the home and its outbuildings burned down and were never restored. 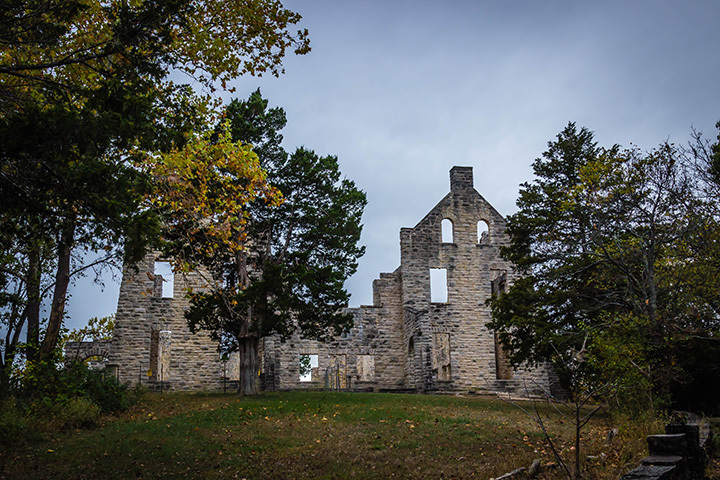 The park system has done enough construction to shore up the ruins and make them safe, and visitors can come there and look out over the beautiful vista and from there explore the rest of Ha Ha Tonka State Park. The Community Bookshelf sounds like a bookstore, but it’s actually a sprawling artwork (nine feet tall and 25 feet wide), spanning the south wall of a library parking garage. The “shelf” displays the spines of 22 books, with 42 titles—each title suggested by the reading public and selected by the Kansas City Library Board. The titles all reflect pieces of Kansas City history. An unusual piece, the Community Bookshelf has become a fixture in downtown Kansas City. The World’s Largest Pecan sounds like something the family in the movie “Vacation” may have stopped to see. It is, however, a concrete replica of a pecan, approximately the size of a school bus and weighing 12,000 pounds. Sitting near the highway through Brunswick, it sits across from the old Nut Hut building, where George and Elizabeth James—the people who commissioned the giant pecan—sold nuts from their pecan farm. The area is a center of pecan activity. Elephant Rocks State park is the site of some of the most scenic camping and hiking in Missouri, but the Elephant Rocks themselves are what makes it worth the visit. A unique geographical feature, these huge, rounded boulders are lined up along the crest of a hill, looking exactly like a parade of elephants marching single file on its way to somewhere else. Visitors can walk under and between them, or climb to the top to look out over the valley beneath. If you live in Springfield, you know it’s there, but nobody really makes a big deal about it. If you’re visiting, you might have to ask several people before you find your way to it. This 35-foot tall, 11-ton fork was once in front of a restaurant on the other side of town, but when that restaurant failed, an ad agency collected the fork and stuck it in the ground outside their offices. If you’re going to be in the area, it’s worth a stop to take a picture beside the world’s tallest fork, and it won’t cost you a cent. Of all of Missouri’s claims to fame, one of those most like to be recognized outside of the state is the Precious Moments Chapel in Carthage. Some people are crazy about those pale, teardrop-eyed children portrayed in the Precious Moments statues and illustrations. The Chapel includes extensive grounds marked with statues and fountains of Precious Moments children, and the chapel itself decorated with Precious Moments stained glass and murals. Admission is free, and tours are given of the chapel and grounds several times a day. Jefferson Barracks Park in St. Louis holds several museums, including the Missouri Civil War Museum, the Laborers’ House and Ordnance Stable, the Powder Magazine Museum, and the Old Ordnance Room. By far the most unique, however, is the Telephone Museum. As the name suggests, the museum houses extensive displays of telephones manufactured from the early 1900s to contemporary times. It also features military telephones, since the Barracks was an operating military training ground at different points from the 1850s on. The displays include interactive and hands-on activities, and were originally created to encourage students to get involved in science, technology, and engineering. A tourist would have to be very dedicated to go seeking this particular unusual attraction, but for those willing to stay up and drive out to the middle of nowhere, the Joplin Spooklight is an unforgettable experience. The first recorded sighting was in 1836, and it has been seen regularly, sometimes nightly, ever since. The light is described sometimes as a ball of fire, sometimes as a bouncing light that looks like a lantern being carried far ahead. The light moves along the road, sways side to side, and sometimes hovers over the treetops or zips along the road at high speeds. The best time to see the Spooklight seems to be between 10 p.m. and midnight, and if you’re quiet and wait patiently, locals say it will almost certainly show up. Pythian Castle in Springfield isn’t exactly the kind of place you can just pop into—it’s not on a main road, and it’s only open for events or for the twice-daily scheduled tours. But it’s a favorite destination for weddings, dinners, dances, mystery theatre performances, historical tours, and their most popular events, ghost tours. It is considered one of the more haunted locations in Missouri, so ghost tours and investigations are an important part of the castle’s life. Paranormal groups are invited to investigate on Tuesday and Friday nights—using their own equipment of course—and the castle staff offer both daytime and nighttime ghost tours of the building. Marceline was Walt Disney’s hometown and the basis for Main Street U.S.A. at both Disneyland and Walt Disney World. The Walt Disney Hometown Museum commemorates Walt’s time in Marceline, and contains a unique collection of Disney artifacts, including hundreds of personal letters between members of the family, ranging from the early 1900s to the late 1960s. There are Mickey Mouse dolls, photographs of the Disney’s visits to Marceline over the years, and a Midget Autopia car (the whole ride was dismantled and removed from Disneyland, donated to Marceline for use at the city park). Fantastic Caverns is located just outside Springfield, Missouri, and is the only ride-through the cavern in the country, and one of only a few in the world. Visitors ride in Jeep-drawn trams along an ancient river bed. It’s always about 60 degrees inside the cave—cool, but warm enough to keep the cave open all year around. The whole tour takes just under an hour, during which visitors are introduced to the cave’s history, including being used as a speakeasy and moonshine distillery, a dance club, and a movie theater. The Gateway Arch in St. Louis is one of the most recognizable symbols of Missouri, but it qualifies as an unusual attraction because it’s the only one of its kind on the world. It was built alongside the Mississippi River in 1963 and is the world’s tallest arch. It’s also a national monument that visitors can enter inside, including taking trams up either leg to the very top and looking out the narrow windows over the city. The Museum of Westward Expansion, located underground between the legs of the Arch, offers a fascinating look into an important part of American history. College of the Ozarks, at Point Lookout near Branson, is unusual among centers of higher education in that it does not charge tuition for full-time students. The program does require students to work, however, and one of the most popular student work stations is the college’s Fruitcake and Jelly Kitchen. Since 1934, students have turned out hundreds of thousands of delicious cakes, jams, jellies, and apple butters. The fruitcakes, in particular, have a well-deserved reputation for moistness and flavor. Tours are available between 8 a.m. and 5 p.m., Monday through Friday.